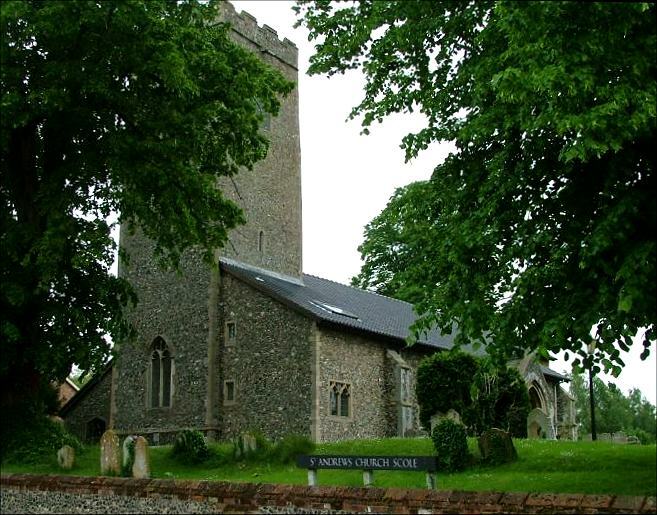 In the days before the bypass, this church was a familiar sight to thousands of travellers every day. It seems incredible now, but the main roads between Ipswich and Norwich and between Bury and Yarmouth crossed here, to the east of Diss. The most famous feature of the parish is probably the large pub sign which overhangs the road. Traffic congestion was so bad until about fifteen years ago that frustrated drivers certainly had plenty of time to contemplate it. 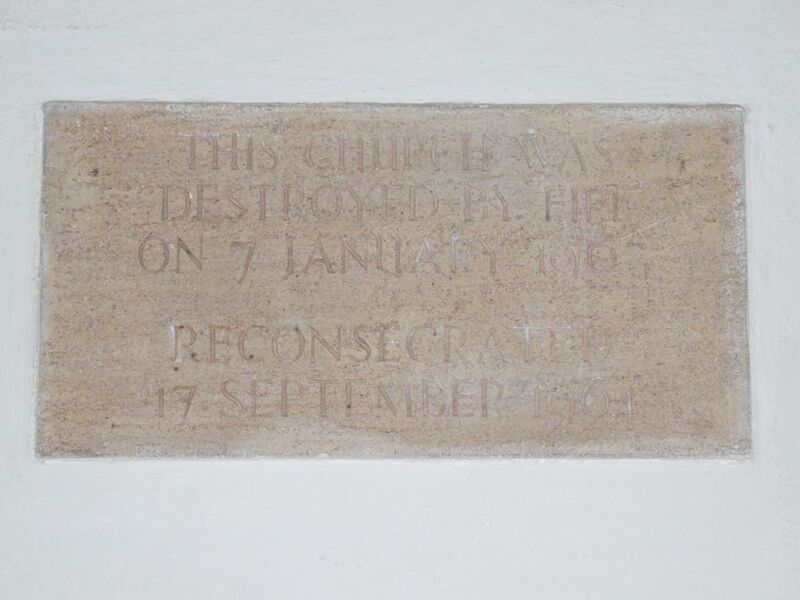 A driver looking out the other window on the seventh of January 1963 would have had something rather more dramatic to contemplate, for on that night the church of St Andrew was completely destroyed by fire. The blaze was started by an arsonist, and was pretty thorough. 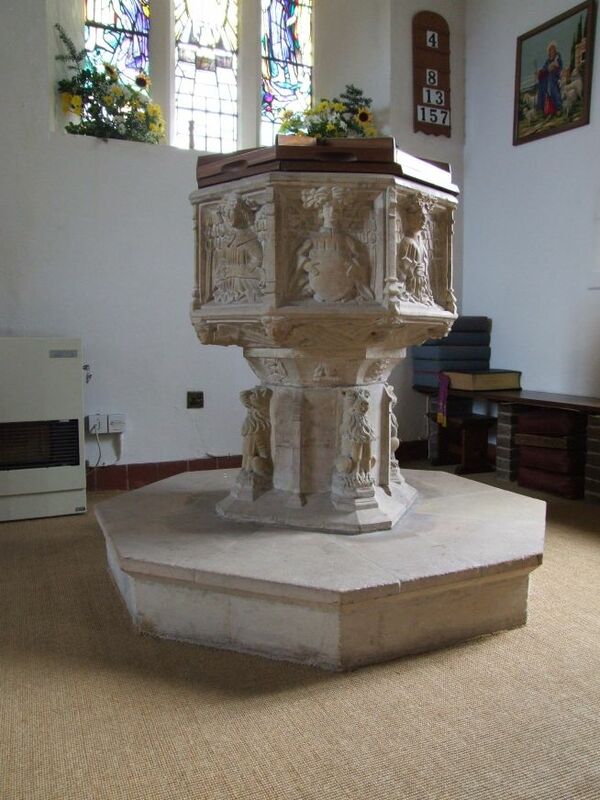 By morning, all that remained were the tower, the font and the walls up to eaves level. 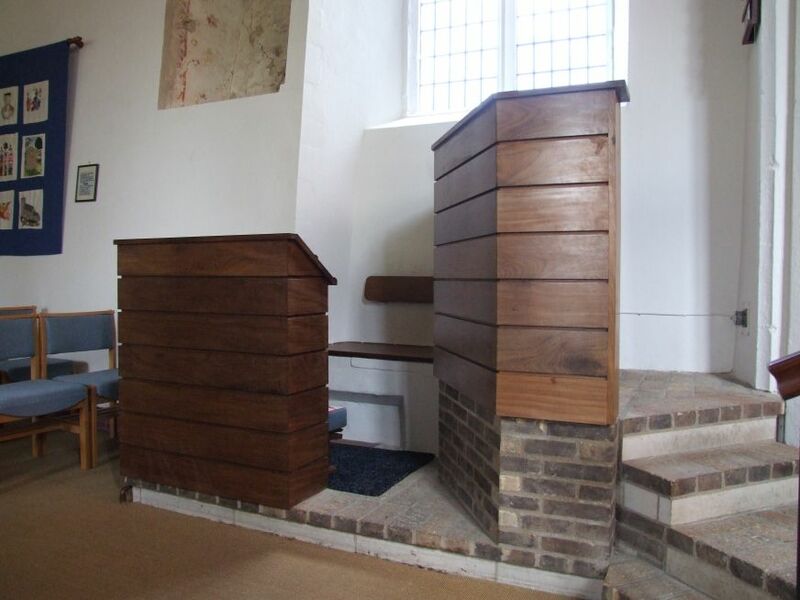 Work started on reconstruction straight away, and has left something unique in the county, an 1960s interior still redolent of the excitements of the Festival of Britain and Anglican post-war optimism. 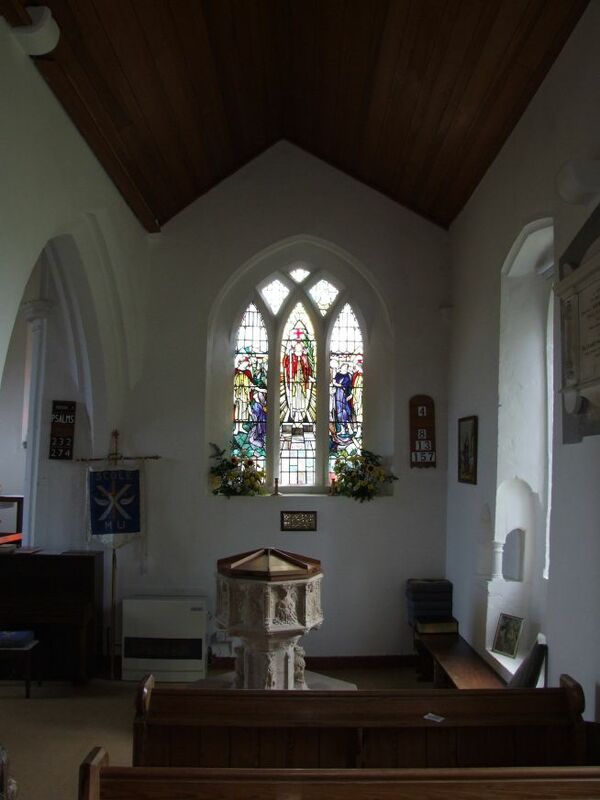 And there's something more: it is an ill wind indeed that blows nobody any good, for one of the elements of the refurbishment was a superb east window by Patrick Reyntiens. 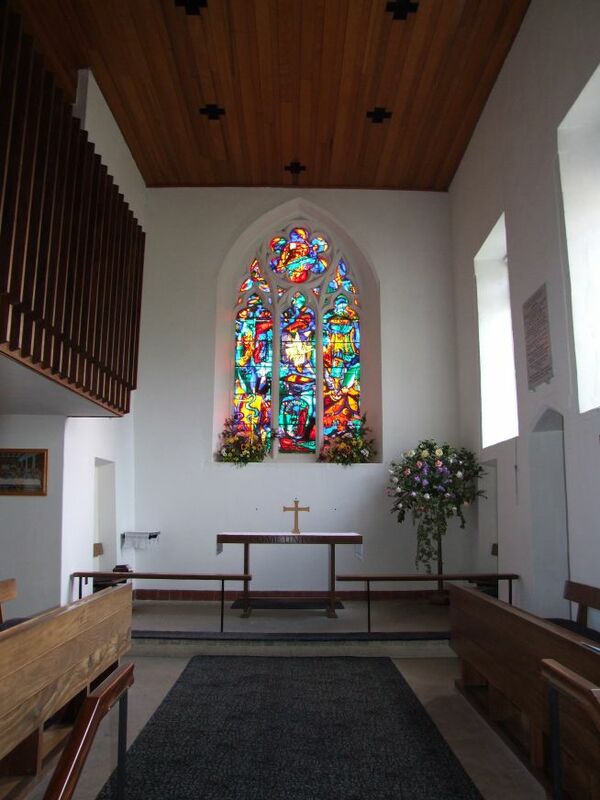 He is most famous for the baptistry window at Coventry cathedral, which he created to the designs of John Piper. I have previously recounted the story of how, when I first came this way in May 2005, I was refused entry. This was the first time this had ever happened in visits to more than 1,500 churches, so it took me a bit aback, I can tell you. 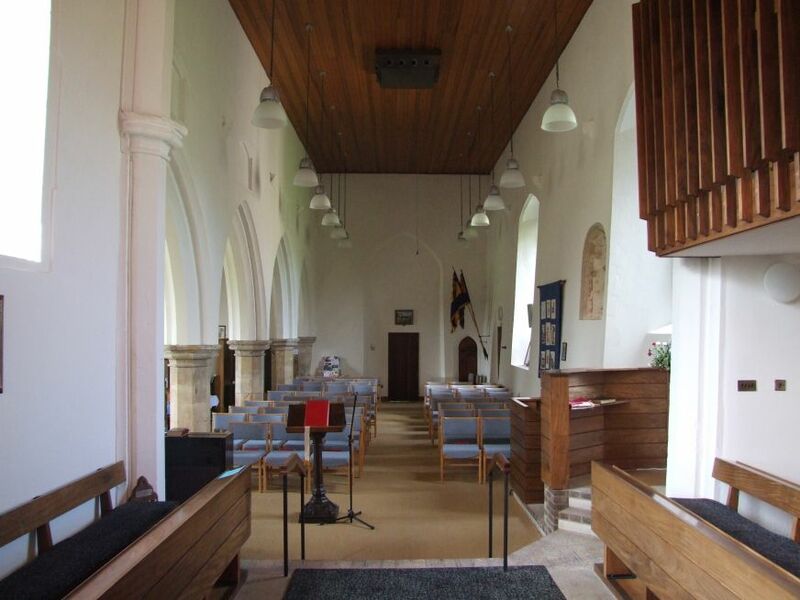 I had phoned the churchwarden of the time, who made it quite clear that the building wouldn't be opened to visitors. I later discovered that other people had experienced the same thing, which is obviously unfortunate, and no way to run a parish church. In the couple of years, however, that had been a complete change of heart at Scole. 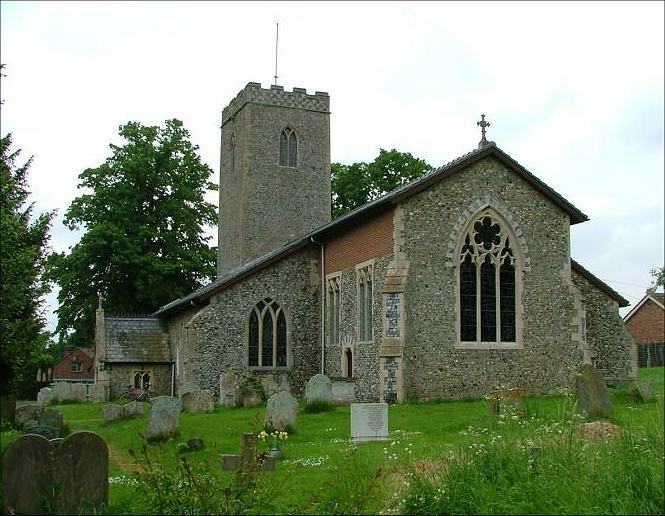 The Diocese of Norwich appointed an Open Churches Officer, a European-funded initiative to 'promote and interpret' medieval churches by supporting PCCs in opening as many churches as possible and improving facilities for visitors. His name was Ralph Barnett, and fortuitously he lived in Scole. 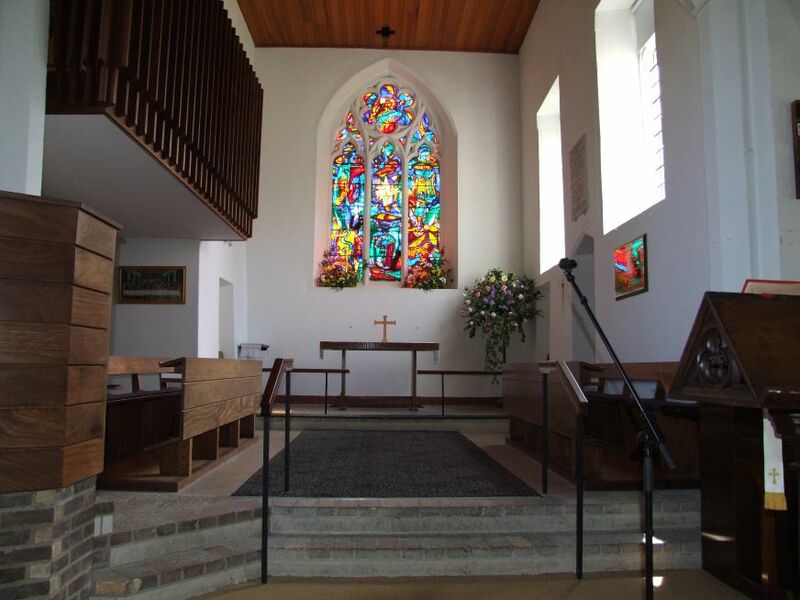 At the same time, the churches of the Scole benefice had appointed a new and energetic Priest. It was as if a wave of renewal was running up the Waveney Valley. 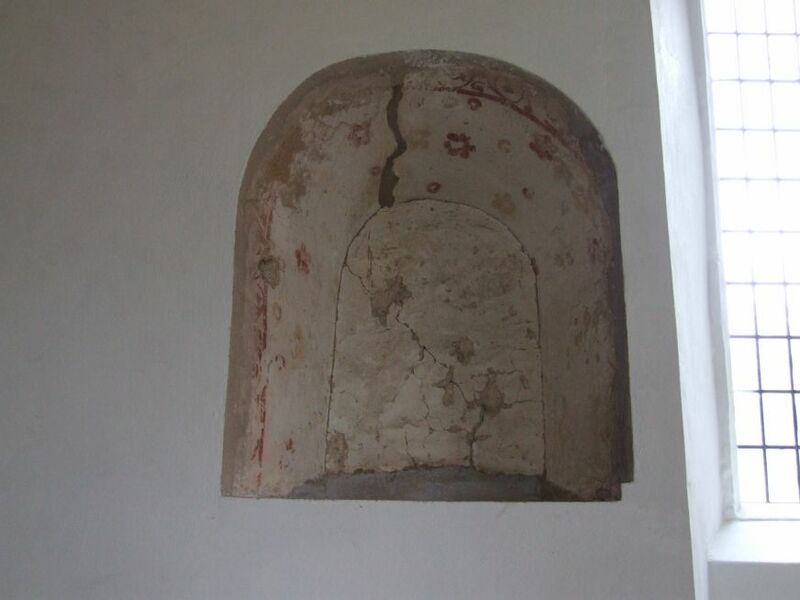 Churches kept locked in living memory except for services were making themselves accessible. 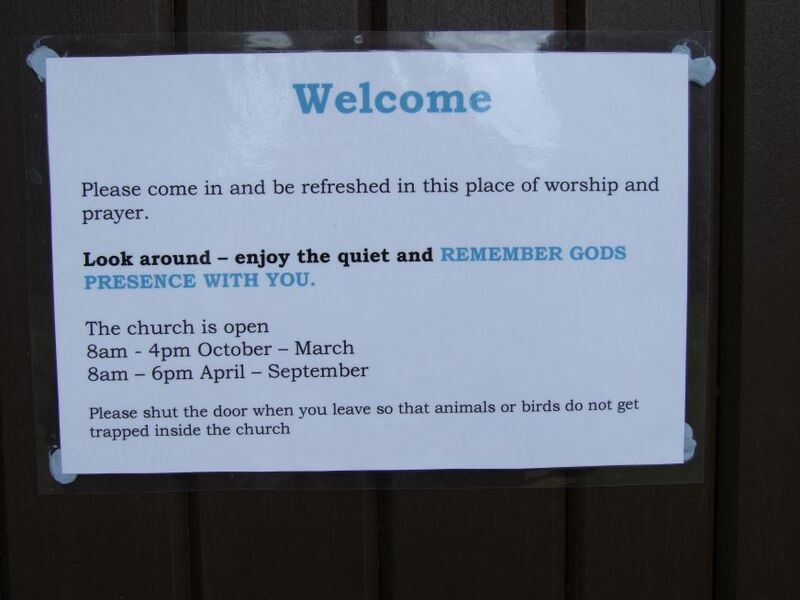 St Andrew went one better - it is now open in daylight hours every day, with a big sign outside to tell you so. 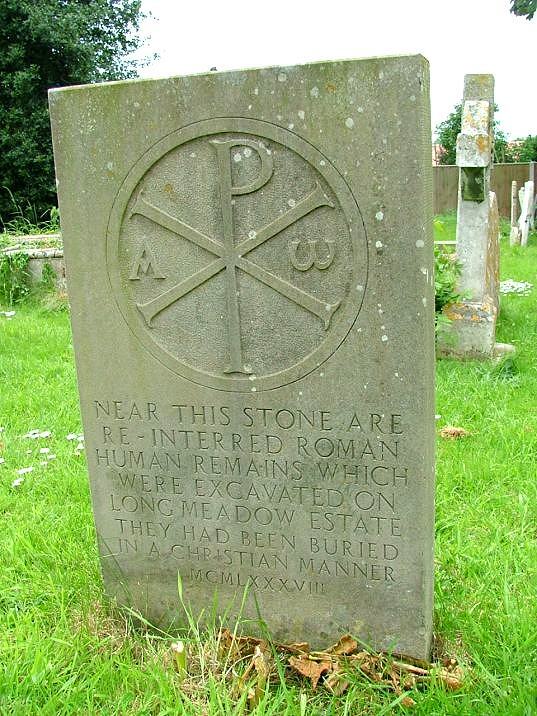 We actually met Ralph, quite by coincidence, at Billingford, a couple of miles off, and he was very keen that I should go back to St Andrew and see it as it is now. And, so, we did. You climb the long sloping path from the road, and then open the door, and step inside. Simple as that. It is said that nothing feels quite as old as the recent past, and there is something in that. St Andrew's interior is very much in the spirit of its age, but it is an age I happen to like, because it makes me think of my childhood. The golden varnished wood of the roof running the full length of the building reflects back a simple, almost Scandinavian range of furnishings. 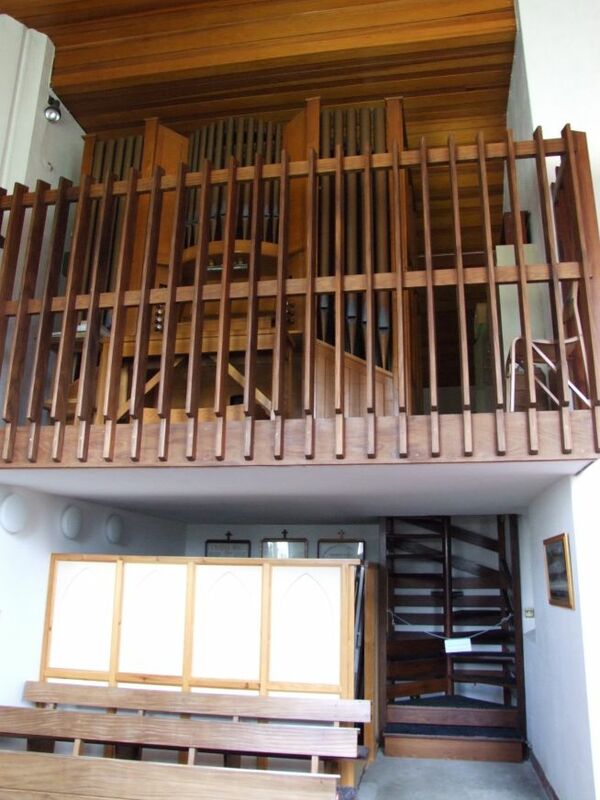 I loved the lattice of the organ loft, and the stark reading desk and pulpit in the manner of a Prayer Book church. This quietness offsets the grand statement of Reyntiens window, which must be one of the brashest and most glorious of its period in the whole of East Anglia. The window appears at first to be a complete abstraction, but as you examine it you see that it is a collection of scenes from the Old and New Testaments, organised in a relatively conventional style. The central image is the Resurrection, flanked by the Crucifixion and the Ascension. At the bottom is the serpent and staff of Moses, and Jonah being swallowed by a whale. Up at the top is the Lamb of God seated on the heavenly throne. All very dramatic. A quieter set of images fills the east window of the south aisle, rather more in the style of the previous decade. This depicts the Risen Christ, flanked on one side by Mary Magdalene meeting Christ in the garden, and on the other by Christ and his comanions on the road to Emmaus. I thought this window was lovely, and it offsets perfectly the medieval font below it, rescued from the ashes of the fire. A patchwork banner on the north wall depicts elements of the building, and was made by parishioners to mark the 25th anniversary of the fire. 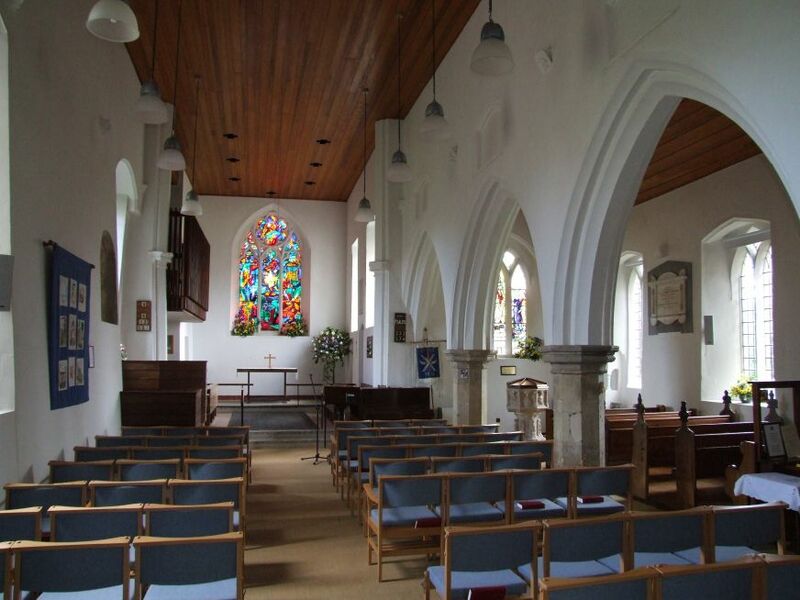 It is now almost half a century since the arsonist struck, and the event has become part of the history of what is the heart of a living breathing community, a community which takes seriously its responsibility for welcoming the stranger and pilgrim within the gate. 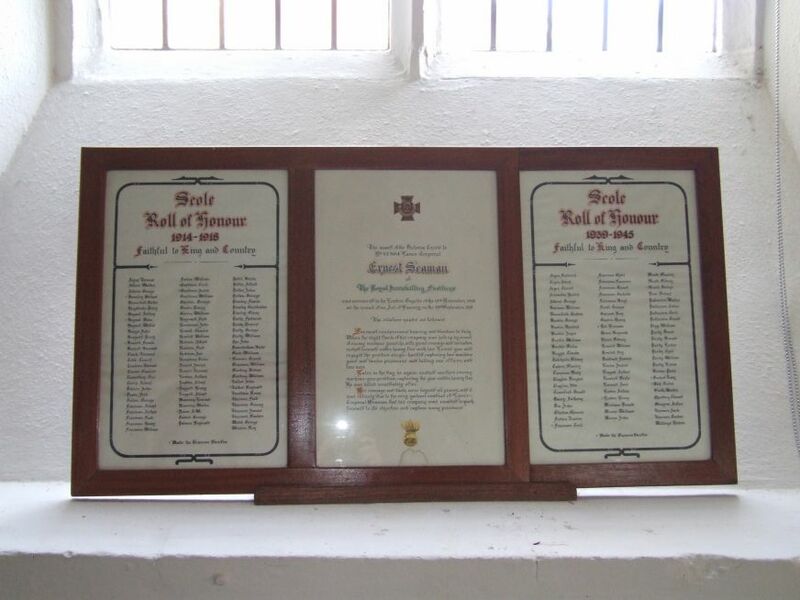 The refurbishment exposed the painted splay of a Norman window, and not far off is the Roll of Honour, recalling that one of Scole's boys in the slaughter of WWI was awarded the Victoria Cross. On the pillars of the arcade opposite, graffiti scratched over the centuries reminds us of other parishioners of the past. 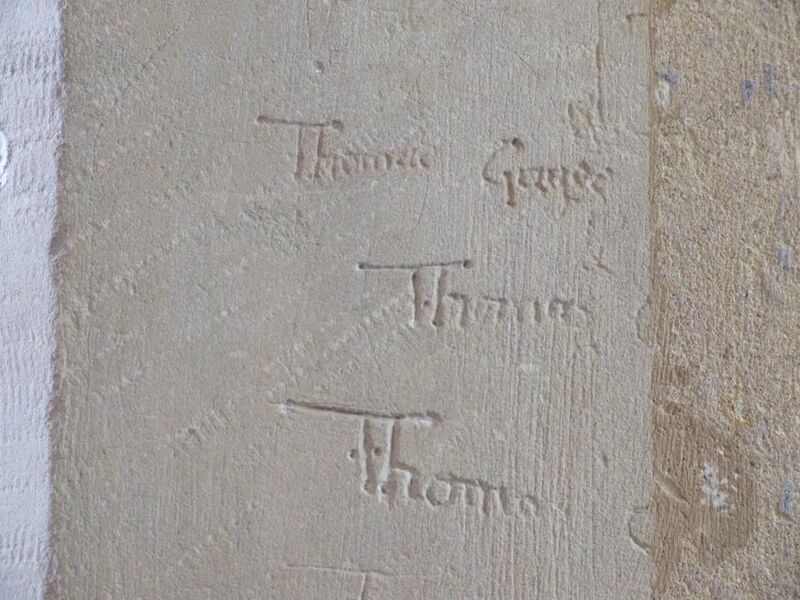 Thomas Gage hid behind one pillar and inscribed his name several times, probably in the 17th century. You can't help imagining that it was a dull sermon in the twilight gloom which drove him to it. But today, St Andrew is full of light.